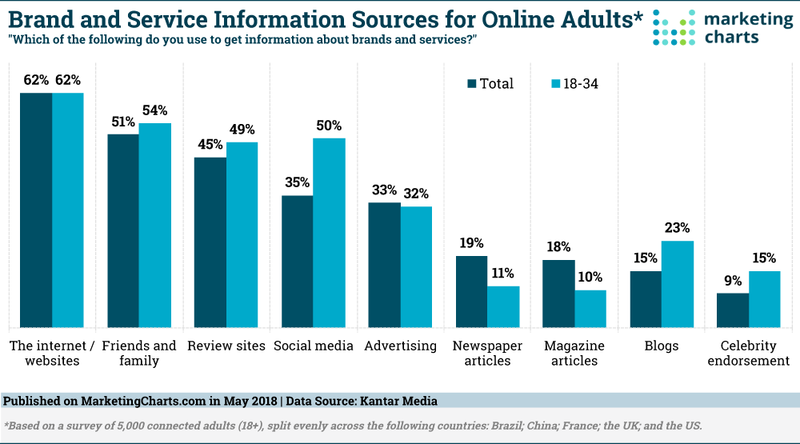 Most online adults across 5 key countries turn to websites in order to find information about brands and services, while about half rely on recommendations from friends and family, according to a report from Kantar Media [download page]. The study indicates that social media is also a popular source of information, though more so in some countries than others. The survey was fielded among 5,000 online adults – 1,000 each in Brazil, China, France, the UK and the US. Close to two-thirds (62%) said they go online to websites to find information about brands and services, while 51% get information from friends and family and 45% from review sites. Interestingly, respondents were slightly more likely to say they get information from social media (35%) than from advertising (33%). Recent research has suggested that social media plays a critical role in inspiring shoppers’ purchases, and that youth are particularly apt to use social media to learn about brands and make purchase decisions. Indeed, the Kantar Media study reveals that fully half of 18-34-year-olds surveyed use social media to get information about brands and services, as do 40% of 35-44-year-olds. Older adults are less apt to turn to social for such information, as only 23% of 45-64-year-olds and 9% of those ages 65 and older report doing so. Youth also exhibit a greater likelihood than older adults to learn about brands and services via blogs and celebrity endorsements, per the report. Furthermore, friends and family are information sources for a slightly greater share of youth than older adults (aligning with other research), though the difference is fairly slight. By contrast, older adults are the most likely to rely on print. Roughly one-third of respondents ages 65 and older get information about brands and services from newspaper articles (34%) and magazine articles (31%), compared to about 1 in 10 respondents ages 18-34. Meanwhile, there are distinct differences among countries, too. Respondents in the US, for example, are less likely than the 5-country average to get information from blogs, review sites and social media, but more likely to rely on advertising for brand and service information. Connected adults in Brazil and China profile as the most heavily reliant on social media: a majority in each country (57% and 52%, respectively) use social media to get information. That compares with 27% in the US, 22% in the UK and just 16% in France. Those aforementioned emerging markets also display unique characteristics in other information sources. Respondents in Brazil (32%) are more than twice as likely as the 5-country average (15%) to get information on brands and services from blogs. And those in China (26%) are about 3 times more likely than the 5-country average (9%) to get information from celebrity endorsements. What Is An Ad, Anyway? But what even constitutes advertising in the eyes of these respondents? Notably, it goes beyond typical advertisements on TV, radio, social media and websites. In fact, more than 6 in 10 respondents believe that messages from brands in news and articles in print or online count as advertising. Likewise, roughly two-thirds feel that sponsorship of TV and radio programs as well as of sports events and teams constitute a form of advertising. And close to 2 in 3 believe that product placement in films and TV programs count as ads. In most cases, older adults were more likely than youth to say that these various forms of messaging constituted advertising. But in a separate question, younger adults displayed greater positivity towards ads in general than did their older counterparts. Connected adults’ attitudes to ads haven’t changed in the past year, per the report. Some 46% say advertising doesn’t bother them one way or another, though more say they generally dislike (31%) than like (24%) advertising. The highest levels of positivity towards advertising in main media forms is reserved for cinema ads, followed by TV, out-of-home and magazines. That generally aligns with research from Kantar Millward Brown released earlier this year, in which cinema, outdoor and TV also led the way in ad receptiveness. On an encouraging note, one-third of respondents this year believe that advertising is changing for the better. On a more discouraging note, that’s down slightly from last year’s 36% who saw good change. Although close to two-thirds of consumers say they prefer to see ads that are relevant to their interests, it seems that advertisers aren’t always delivering. That’s because close to 3 in 4 report sometimes seeing the same ad over and over again, and a majority (56%) often see ads online for products they’ve already bought. Such repetitiveness and irrelevance are frustrations commonly associated with retargeting ads, perhaps leading to their weak appeal with consumers. Still, respondents appear to have some appetite for seeing ads across media. Almost half (47%) agreed that advertisers should use a variety of media to get their message to them. And when thinking of the times they’d seen ads for a brand that was advertising across different types of media, about 3 times more respondents said that seeing the different ads made them more (33.5%) than less (11.9%) like to talk about the brand with friends, colleagues or family.